You can add a personal touch to your holiday decorating by making your own Thanksgiving decorations. From table-top decor to accent pieces throughout your home, these projects allow you to show off your creativity and add beautiful touches at the same time. If you have a few extra canning jar rings around your house, you can whip up this adorable pumpkin decoration in a couple of hours. It makes a great centerpiece for your holiday table or accent piece for your mantle or bookcase. Use the ruler and scissors to cut the scrapbook paper into 18 strips that are 12 inches long and 1/2 inch wide. Spread a plastic bag or drop cloth on your work surface. Liberally apply decoupage medium to the outside of a canning jar ring. Smooth a strip of paper around the ring, using more decoupage medium on top. Repeat with the remaining jar rings and allow them to dry. Cut a piece of craft wire that is about 12 inches long. String all 18 jar rings on the wire. Bend the wire so the rings form a pumpkin shape and twist the ends of the wire together. Continue twisting until the wire is tight and then bend the ends back so they don't show. Cut the brown fabric into a rectangle about four inches tall by eight inches wide. Starting at one four-inch end, roll it up to form the pumpkin's stem. Insert the stem into the center of the pumpkin and pull it through from the bottom. Use the scissors to cut two burlap leaves. Hot glue the leaves to the top of the pumpkin at the base of the stem. Celebrate fall and help your Thanksgiving dinner guests find their seats at the same time. This easy craft is fun for the whole family. You'll need to make the leaves at least 24 hours before dinner so they have time to dry properly. Use the scissors to trim off the stems of the leaves. Place the leaves face-up on a protected work surface. Squirt some of the gold craft paint onto a paper plate and use your paint brush to liberally apply it to the fronts of the leaves. You can do the backs too if you choose. Allow the leaves to dry for a few hours. Neatly write the name of a dinner guest on each leaf using the brown marker. Let the marker dry completely before touching it. To use the place cards, tuck them into a wine glass with a napkin or place them in the middle of a dinner plate. A pennant banner brings major impact to your holiday decorating, and it's fun to make. You can even create this pretty banner without getting out your sewing machine. It will take you a couple of hours. Start by cutting out the linen triangles for your banner. The size of the triangles will vary based on the dimensions of the letter stencils you plan to use. Make each triangle a bit larger than the letter. You can make your banner say anything you want, but for "Give Thanks," you'll need 10 linen triangles. Cut out the same number of burlap triangles. Each burlap triangle will be slightly larger than the linen triangle. Set the burlap triangles aside. Squirt some brown craft paint onto the paper plate. Dip the stencil pouncer in the paint. Place the letter stencil over the first linen triangle, centering it so it will look nice. Use the pouncer to apply paint to the stencil and carefully remove the stencil when you're done. Repeat this process for each letter. Let the paint dry according to the manufacturer's instructions. Layer one linen triangle on top of a burlap triangle, adjusting the placement until you like the look. Using your glue gun, apply a line of glue on the back of the linen triangle. Carefully press the linen triangle onto the burlap triangle to create your layered piece. Repeat with all the letters, allowing them to dry thoroughly. Unroll the lace. You'll be adhering the first triangle at least two feet from the end, allowing you enough room to tie the banner up for display. Apply a line of glue along the top edge of the layered triangle and press the crocheted lace into the glue. Repeat with each layered triangle, but leave a space between words. Trim the lace so that you have an equal amount on each side for tying. Allow the glue to dry. After everything is dry, tie the ends of the lace up to display your banner. Decorating your holiday table is fun and easy with this simple project. You can use this process to create beautiful place mats, table runners, or table cloths. Making a place mat takes about an hour. Cut out the burlap fabric in the size you'd like. For a place mat, a good size is about 15 inches by 20 inches. Table runners and table cloths will depend on the size of the table. Unravel a few of the threads from the edges of the burlap to give it a slight fringe. Spread out the scraps of cotton fabric and iron them. Following the instructions on the adhesive interfacing, apply the interfacing to the back side of each fabric scrap. Use a pencil to draw free-form petal shapes on the fabric. It's up to you whether the petals vary in size or are all the same. Cut the shapes out when you are done. To make the flower design shown, you'll need nine petals in each print. Peel the backing off of each petal and arrange them the way you want on the burlap. Place a piece of muslin on top of your ironing board to protect the surface from excess adhesive. Place the burlap on top and press the petal design according to the instructions on the adhesive interfacing you are using. 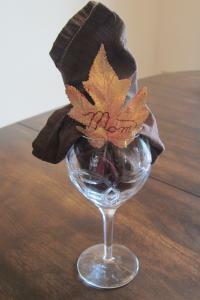 Allow the decoration to cool and enjoy your place mat or other table linens. If you're still looking for some fun craft ideas to give your home some Thanksgiving cheer, try these great options. 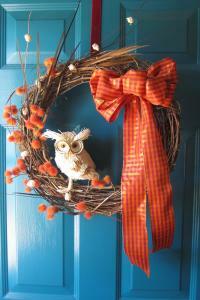 Welcome guests to your home by creating a gorgeous fall wreath for your front door. This adorable design features an owl that adds a whimsical touch. You can purchase all the supplies at your local craft store and make the wreath in a couple of hours. Give your Thanksgiving table a fun and functional centerpiece by creating a turkey candle. With a few simple supplies, you can celebrate the season in style. Take some time before the holiday dinner rush to add a few personal creative touches to your home. Guests will appreciate the handmade beauty of your projects, and you'll feel proud to show off your gorgeous Thanksgiving decorations to friends and family.